Mobile Suit Gundam SEED Destiny Wallpaper: Justice? 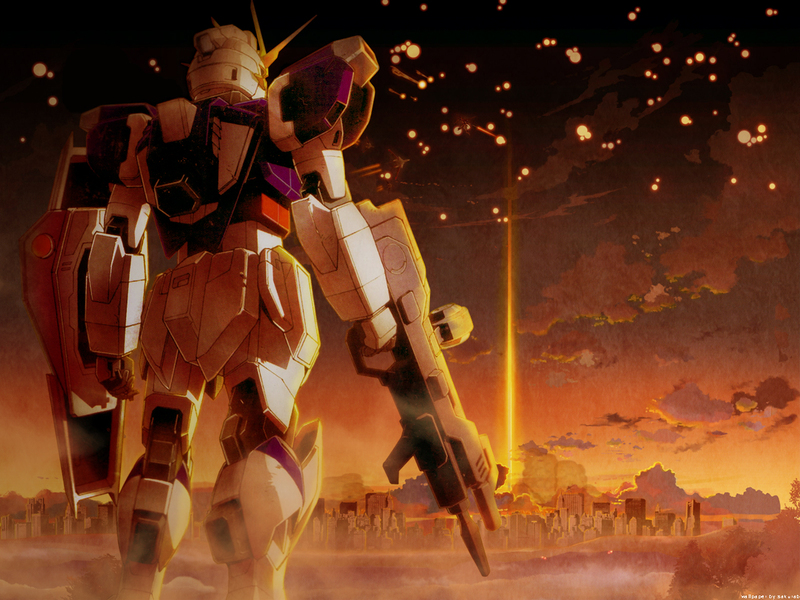 Minitokyo »	Mobile Suit Gundam SEED Destiny Wallpapers » Mobile Suit Gundam SEED Destiny Wallpaper: Justice? Ill be submitting all of my old work here at MT over the next few days. So my first submission will be my GSD wall. ok so this is really an all paint wall, except for the buildings in the bg, which were vectored then painted over for highlights. The bg is a "The Place Promised In Our Early Days" scan that was painted over and altered to fit my wall. The battle in the sky is basically a bunch of screenshots taken from the series. And finally because im a texture abuser, i couldnt help but to use one :3 I also painting the smoke and fire behind the buildings (fire is kinda hard to see, but its there lol!). Ah, and im not sure if its confusing or not, but the circly things in the sky are explosions (gundam style explosions :3). Also, i can only submit the 1280x960 here (due to my clumsiness i saved my wall at a smaller res then its actual size =__=), if you want the 1400x1050 (bigger is bettaaar xD), and the widescreen go here..
Oh, and the k1ru your talking about is probably the k1ru here on MT too. Love the sky and the background is just awesome. My only problem is the quality of the scan... wish it was a bit cleaner. Other than that, great job! Wow, first wall in MT and you already get it in the elite gallery. Mez so jealous of your walling skills. Wonderful work like always. I love the background. The lightening is awesome done and gives the wall a really special feeling. I don't really like mecha-walls but this one is special. I would not use it as background but I will definitly fav it in my wallpaper folder at home. Wonderful entry for the competition. OMG, saku-chan you always set the yardstick at the highest. submitting your old stuff, huh? just like me. xD haha. the whitish parts (created by the texture?) in the sky looks a bit funny but the scene and color scheme is wonderful. :P but hey...are those buildings on either side of the beam rifle reflected duplicates of one another? o__o *shrugs* awesomeness nonetheless. so adding to favies. Woww.... Great one ! I love it ! Thank you so much! is it impulse gundam standing? wow i like this one.... it's like you asking "is it what called justice?"